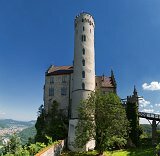 Lichtenstein Castle is a Gothic Revival castle built in the 1840s. It is situated on a cliff located near Honau on the Swabian Alb, Baden-Württemberg, Germany. Today, the castle is owned by the Dukes of Urach, but is open to visitors. The castle contains a large collection of historic weapons and armor.